Arising in the early 17th century, Rosicrucianism is an esoteric spiritual movement that combines elements of occultism, Kabbalah, Hermeticism, alchemy, and mystical Christianity. The Rosicrucians came about with the publication of several texts, collectively known as the Rosicrucian Manifestos, which announced the existence of an unknown esoteric order, promoting the knowledge that it offered. The first of these was the Fama Fraternitatis, published in 1614. The following year, the Confessio Fraternitatis was published, and the third, known as the Chymical Wedding of Christian Rosenkreuz, was published in 1616. Published anonymously, the Rosicrucian Manifestos were widely distributed throughout Europe, and elsewhere. Their message focused on the need to transform the superstition and intolerance that dominated Europe at that time. They spoke also of a science that had been kept secret for decades, but without divulging just what that secret was. These manifestos and the subsequent announcement of a mysterious group of mystics had such an impact that more than two hundred responses were published within the next few years. The Rosicrucians got its name from Christian Rosenkreuz, who was mentioned in all three of the Rosicrucian Manifestos, although many believe that he was used allegorically, and may not have been an actual person, while others credit him as the founder of the Rosicrucians. The tradition is that Rosenkreuz was a doctor who learned esoteric wisdom while on a pilgrimage to the Middle East, possibly though Sufi or Zoroastrian masters, in the early 15th century. He founded the Fraternity of the Rose Cross, and directed the construction of a temple, known as Sanctus Spiritus. Paracelsus, a German alchemist, and astrologer, may have been the actual founder of the Rosicrucians. In the following centuries, several esoteric societies have arisen, claiming to have derived from the original Rosicrucians. Symbolized by the Rosy Cross or the Rose Cross, the largest of these spiritual organizations have been the Hermetic Order of the Golden Dawn. Another is the Rosicrucian Order, also known as the Ancient Mystical Order Rosae Crucis (A.M.O.R.C. ), an international fraternity that is active worldwide. The Rosicrucians have inspired two Masonic rites, the Rectified Scottish Rite and the Ancient and Accepted Scottish Rite, in which the 18th degree is called Knight of the Rose Croix. Contemporary Rosicrucian groups include several Golden Dawn groups and those affiliated with Freemasonry, which will be listed in separate categories. Others include the Rosicrucian Fellowship, Lectorium Rosicrucianism, Archeosophical Society, Order of the Hermetic Gold and Rose + Cross, the Rose Cross Order, Fraternitas Rosae Crucis, Societas Rosicruciana in America, Kabbalistic Order of the Rose-Cross, Aesthetic Rose+Croix Order of the Temple and the Grail, Lectorium Rosicrucianum, Fraternitas Rosicruciana Antiqua, Fraternidade Rosacruciano Sao Paulo, and probably some others not mentioned here. Members of many other organizations are easily recognizable by distinctive clothing. However, the earliest rules for the Rosicrucians prohibited the wearing of distinctive clothing except when officially conducting the work of the Order. Benjamin Franklin is alleged to have been closely associated with the Rosicrucians of his day and to have established a secret group of Rosicrucians who met in Philadelphia. Others have included Leonardo da Vinci, Francis Bacon, Isaac Newton, George Washington, Napoleon Bonaparte, Abraham Lincoln, Isaac Newton, and Walt Disney to that list. The focus of this category is on the Rosicrucians or any of the organizations that lay claim to having arisen from Rosicrucian traditions, with the exception of the Golden Dawn and Freemasonry traditions, as they will be covered in separate categories. Additionally, any informational websites whose topics are focused on the Rosicrucians are appropriate for this category, whether complimentary or oppositional. Like most Americans my age, the first time I ever heard of the Rosicrucians was in the back of a comic book. Claiming that Benjamin Franklin, Isaac Newton, and Francis Bacon were Rosicrucians, their ads promised secret powers and a secret method for the mastery of life. Yes, Rosicrucian advertisements regularly ran in the back of comic books, along with ads for shrunken heads, sea monkeys and X-ray vision glasses. Unlike, I am fairly certain, any of my other friends, I actually filled in the the form and mailed it in to the Rosicrucians in San Jose, California. When I didn't hear back from them in a couple of months, I sent another one in, and another; looking back, I imagine my parents had intercepted my mail because, one day when I picked the mail up from the box myself, I found an envelope addressed to me from the Rosicrucians. I am not able to tell you just what was in that envelope because it didn't make a lot of sense to me and, while I began reading it, I ended up skimming it. I was ten or twelve years old, and I can remember very long paragraphs, strange illustrations, and stuff that didn't make any sense to me. I doubt that I threw it away because I seldom threw anything away, but it disappeared; my mom probably found it. It was no great loss because, apart from a feeling that maybe I wasn't smart enough to make sense of it, there wasn't much there that interested me. I don't know if they still advertise in the back of comic books because it's been a long time since I've looked at a comic book. Fifty years later, here I am, once again trying to make sense of the Rosicrucians. The Rosicrucians are a secret society said to have originated in Germany during the early 1400s. Its founding is attributed to a German doctor and philosopher by the name of Christian Rosenkreuz, whose surname can be translated as rose-cross. Dr. Rosenkreuz studied in the Middle East. It is uncertain, but his influences may have been Sufism, with a dose of Gnosticism. Upon his return to Germany, he recruited a small group of friends and acquaintances, founding the Rosicrucian Order around 1407. At the time of the death of its founder, the Rosicrucians had no more than eight members, all of whom were doctors and bachelors. Its members had taken an oath to heal the sick without payment of a fee, to maintain the secrets of the order, and to find a replacement for himself before his death. Reportedly, three generations of members passed in such a manner before the organization decided to reach out to a larger public. The Rosicrucians published a couple of manifestos between 1607 and 1616, the first restricted to Germany, with the second distributed throughout Europe. Interestingly, much like the comic book ads of the 1950s and 1960s, the organization's first manifesto was not taken seriously by many, but was regarded as a hoax. Its second manifesto gained some attention by hinting that the Rosicrucians were a secret brotherhood of alchemists and sages who were about to transform the landscape of science, religion, and the arts. Their statements were republished several times, along with a variety of pamphlets. Beginning in 1614, hundreds of manuscripts and books were published that discussed the Rosicrucian Order. In the late 1700s, an affiliation between the Rosicrucians and the Freemasons developed, probably brought about by individuals who held memberships in both organizations. Both the Rectified Scottish Rite and the Ancient and Accepted Scottish Rite showed Rosicrucian influences. Egyptian, Druidic, and Greek mysteries were added to the Rosicrucian's alchemy system around 1782. Various groups formed in the late 1800s and early 1900s, claiming Rosicrucian origins, some of which continue in existence today. Some of these groups profess to possess esoteric knowledge related to the teachings of Christianity, while others are associated with Freemasonry. Still others, such as the Order of the Golden Dawn, are considered to be initiating orders that emphasize Western mystery traditions while retaining many Eastern methods and teachings, and may not consider themselves to be Christian organizations. What do the Rosicrucians believe? That is a question that may have been easier to answer a few centuries ago than it is now, as there are different branches, or orders, of Rosicrucians who do not necessarily hold to the same beliefs. However, one theme that is common the Rosicrucianism appears to be mysticism, or the idea that they possess secret knowledge. To those on the inside of the Rosicrucians, their beliefs may indeed be clear. Secrecy, after all, is central to all Rosicrucian organizations. However, to those on the outside, Rosicrucian theology appears vague and undefined. Authored by the late Joseph J. Weed, who was affiliated with the Rosicrucianism Order AMORC, and appointed Grand Councilor for the North Atlantic States. Several articles, published between 1939 and 1964, are published here, covering topics such as the significance as the Rosicrucian Cross, meditation, the birth of Christ, baptism, and illusion. A biography of the author and a list of his books are included. 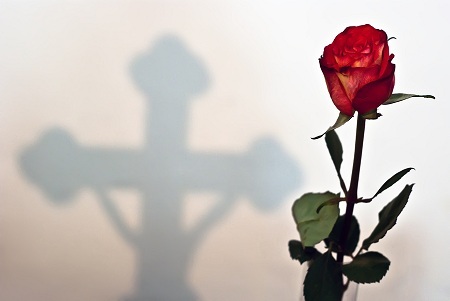 The official portal for the Ancient and Mystical Order Rosae Crucis offers links to other official sites of the Rosicrucian Order, including the websites of Rosicrucian Grand Lodges, listed in twenty-three languages, the Rosicrucian Community site, and other informational sites. Other resources include an overview of the Order, a link to where contributions or inquiries about membership may be made, recent promotional or informational videos or images, and a library of documents. The official site of the Rosicrucian Order, also known as AMORC, the acronym for the Latin form of the organization's name, which translates to the "Ancient Mystical Order of the Rose Cross." A history of the Order is presented here, along with an overview of its organizational structure. A description of its philosophies, and on becoming a Rosicrucian student are included, along with several informational text files, video, and a directory of Rosicrucian centers and facilities. The Rosicrucian fraternal order and school of mysticism serves the ideals of the Rosicrucian movement, offering an overview of its history, teachings, and visions, as well as a system of study for those who feel an urge to travel along the path of spiritual evolution. Its membership policies, contacts, and a private area for registered members are included, available in English, French, and Portuguese. A blog and a library of informational documents are featured.. Presented in English, French, Portuguese, and Spanish, the official site of the OKRC presents a profile and history of the Order, including its organizational structure, traditions, membership policies and initiation procedures, and an overview of its work and practices, online study program. Also discussed are the traditions upon which the OKRC drew, including Gnosticism, the Christian Kabbalah, Chivalry, Rosicrucianism, Martinism, and Occultism. Founded in 1935, the school of esoteric Christianity teachers a form of Christian Gnosticism based on the concepts and symbology of Rosicrucianism, the Cathars, and other forms of mystical thought, such as Hermeticism and alchemy. Its official international site features an interactive map showing its worldwide locations, youth and children's programs, educational goals, photographs, answers to frequently asked questions, and administrative contacts. Established in 2007, the independent Rosicrucian Order aspires to be truly Rosicrucian in its aims and practices, to preserve and spread the interest in Christian esotericism through study, debate, and meditation. Its organizational structure is outlined here, along with its membership policies, Rosicrucian manifestos and imagery, a library of informational articles and documents, and links to related sites. Maintained by and for members of the Rosicrucian Fellowship, but not an official site of the Fellowship, registered members are invited to submit photographs, artwork, articles, manuscripts, letters, announcements, and other matters for publication, each to be evaluated on the basis of the precepts for the Rosicrucian students, and will be used at the discretion of the site administrators. A blog is included. The Rose Croix Journal is an international peer-reviewed journal, published by the Ancient and Mystical Order Rosae Crucis (Rosicrucian Order), that publishes articles on a variety of topics related to science, history, the arts, mysticism, and spirituality, from a Rosicrucian perspective, along with research. The current issue is available online, along with an archive of past issues. Subscriptions may be made online. Presented in English, German, Italian, Russian, and Spanish, the site was created under the auspices of the Sovereign Council of the Rose Cross Order, and offers greetings and an introduction for those who may be new to the Order, as well as an overview of its traditions, organizational structure, historical references, and the benefits of membership. Its official publication, Triangle Magazine, and other resources are available. Intended for members of the Ancient and Mystical Order Rosae Crucis, the site features a list of Rosicrucian groups, sorted by city, state, province, or island, and members are encouraged to register for an account, joining the group where they live, surrounding groups, and in groups where they travel often. Other resources include videos, images created and shared by members of the community, and a calendar of events. The educational institution uses a variety of media and approaches to present the Rosicrucian view of the past, present, and future, particularly as they relate to the diversity and relationships in nature and amongst cultures. Directions and hours of operation are given, along with a calendar of scheduled events, its membership policies, benefits of membership, and a membership form. Guided tour tickets may be purchased online, and a photo tour is available. The Rosicrucian Fellowship Headquartered in Oceanside, California, the Rosicrucian Fellowship is also known as An International Association of Christian Mystics. Founded by Max Heindel in 1909, the TRF is an independent Rosicrucian Order teaching the Western Wisdom teachings of the Rosicrucians. Its teachings, precepts for the Rosicrucian student, and Rosicrucian Online University are presented, along with downloadable pamphlets and other articles. Created and maintained by the Rosicrucian Fellowship of Oceanside, California, the site features archived copies of the Rosicrucian newsletters between September of 1997 and June of 2005, as well as well as December, 2005. Other documents or resources include a Holy Night Service, and that of international Rosicrucian meetings in Austria in 2004, the latter in five languages. Links to additional online resources are included. Offering selected articles from the American Rosae Crucis, Mystic Triangle, and Rosicrucian Digest, which include the writings of or about Harvey Spencer Lewis and Ralph M. Lewis, the first and second Imperators of the Rosicrucian Order, as well as Raymond Andrea, first Grand Master of AMORC in Great Britain. Other documents include writings to the Cathedral of the Soul, Rosicrucian poetry, and various writings by Rodman R. Clayson, Nicholas Roerich, Joseph J. Weed, and others. Also known as the Society of Rosicrucians, and the Most Holy Order of the Ruby Rose and Golden Cross, the SRIA is an independent Rosicrucian Order. The Society was founded by Sylvester C. Gould and George Winslow Plummer in 1907. Its history and an overview of the organization are presented, along with biographies of its founders, its organizational structure, and its associate and collegiate systems. SRICF is Rosicrucian Society based in the United States, and founded in 1880 by Christian Freemasons, and chartered by Societas Rosicruciana in Scotia, the Scottish organization. Its history, designations, officers, Chief Adepts, and Supreme Magi are acknowledged, along with a description of the organization, its colleges, membership policies, and contacts. Items for sale may be purchased online. Search for Rosicrucianism on Google, Bing, or Yahoo!